The Safari Club International Convention, held this year in Reno, Nevada, is like the metaphoric pirate's treasure trove of the finest shooting and hunting equipment, guns, art and jewelry that the human spirit can generate. The cornucopia of shotguns dazzles the mind and spirit, for here are the most elegant, most elaborate and most technically advanced on the planet. I spent hours visiting with most of the shotgun manufacturers and importers. 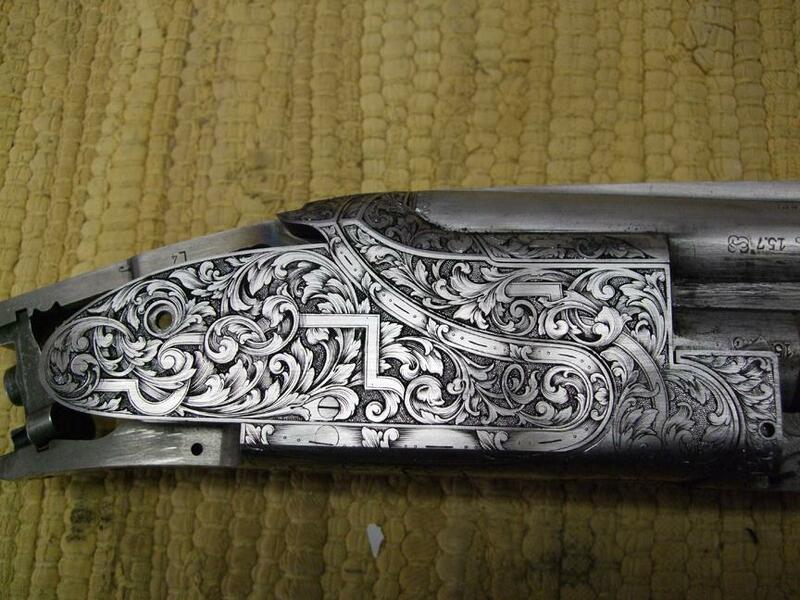 I share with our Shotgun Life readers several-but not all, of course-of the guns and engraving and accoutrements I found most beautiful and creative. I've known Tony Galazan for more than 10 years. I admire him. I respect his voracious work ethic and his tenacity. The Connecticut Shotgun Manufacturing Company exhibit at the Safari Club International Convention, I believe, offered the largest display of high-art, super- premium guns. That Tony sold every gun is conclusive proof that the market acknowledges his world-class skill. 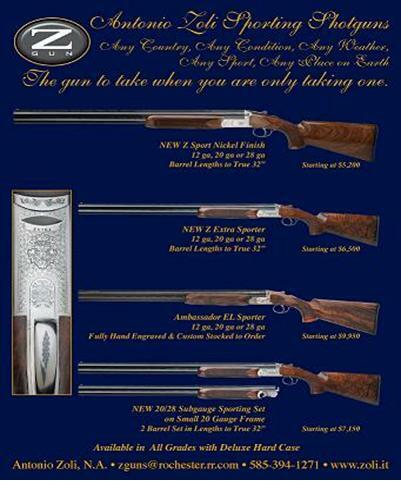 Stunning over/under and side-by-side shotguns are produced under the Galazan name. In addition, the company manufactures identical replicas of several of the greatest American shotguns, including the Winchester Model 21, the original Parker shotgun and the A. H. Fox shotgun. Tony also builds a Winchester Model 21 in a .22 caliber double rifle configuration. His guns boast engraving by the world's finest and most desired craftsmen, including Mauro Dassa and Mario Terzi. Tony has created an arms empire in the United States. The guns seen here were engraved by Mauro Dassa of Incisioni Dassa. 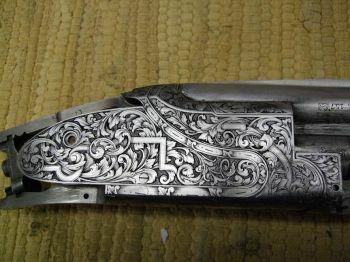 Visit his website http://www.connecticutshotgun.com to leisurely study custom guns unsurpassed by any producer. The firm Hartmann & Weiss was formed in Hamburg in 1965, the result of the serendipitous intersection of these two dedicated gunmakers. Otto Weiss, an escapee from Communist East Germany, had worked at James Purdey & Sons in 1960 and then took a job in Hamburg in 1964. There he met Gerhard Hartmann, who had trained in Ferlach, Austria, followed by working at Krieghoff and then fortuitously worked in Hamburg. The shotguns presented at SCI were transcendent, forming an almost spiritual relationship between them and the human being. The side by side shotguns were based on the Beesely/Purdey self-opening hammerless actions. The Boss-style over/under guns were faithful to the Boss patents in every manner. These guns were case colored by St. Ledger's in Birmingham and were, honestly, my favorite at the show. Johann Fanzoj has been making world class sporting arms since 1790, placing the company into that rare pantheon of the oldest, continuous family businesses on the planet. Their factory is located in Ferlach, the picturesque historical arms center of Austria. I visited Fanzoj about seven years ago. I was dazzled by their intricate work. I even handled a three-barrel double rifle and shotgun combination gun being made for none other than Vladimir Putin. Here is a photograph of one of Fanzoj's classic 'signature' shotguns, a three-barrel game gun. Fratelli Piotti is another member of the pantheon of Gardone's finest gunmakers. I visited Piotti in March, 1997, celebrating a birthday. I spent hours with the brothers Araldo and Faustino, the company's founders, seeing how a world class sporting arm is made. I was so impressed with their work I had a bespoke gun made. Piotti remains a family business, founded in the early 1960's and is noted by its dedication to the highest quality control and technical innovation. A large selection of Piotti shotguns was available at its proprietary exhibit at the SCI Convention. Many fabulous Piotti guns were exhibited at the William Larkin Moore booth fifty feet away. I was most attracted to the aesthetics of Piotti's Boss-type over/under constructed with the time-consuming but very strong chopper lump method. The bores are drilled rather than cold hammer forged, resulting in perfect concentricity. The Boss style models were available in 12, 20 and 28 bore and anyone of them would have been a delicious addition to the collection of any person's fine guns. They handled so fluidly as if they could be moved by thought alone. It has risen like a meteor to become one of the preeminent gunmakers in Val Trompia. Please see their website at http://www.piotti.com. FAMARS was one of the other gunmakers I visited during my 1997 visit to Gardone Val Trompia. The factory is modern and banked with vast windows to allow natural light to envelope the workers. FAMARS has invested vast sums of money in upgrading their machinery to include the most sophisticated CNC and electro spark reduction machinery. The tolerances of their guns equal NASA levels. Shown here is their new two-barrel dove gun. The firearms on display at SCI were stunning beyond description. I had a preference for their Poseidon, a new over/under model featuring the most creative design advance of a Holland-style sidelock in the last one hundred years. The Poseidon features a full sidelock on a removable trigger plate. The locks are engraved in the same pattern as is the action of the gun. To see photos of this remarkable Poseidon, check out their web site at http://www.famars.com. I am pleased to write that I have had a long and productive relationship with Benelli. Hard to believe but it was about 11 years ago when Beretta invited me to Gardone Val Trompia to write a comprehensive article on Beretta and its recently acquired companies. Benelli was one of the companies I visited and wrote about. I have recently received a Benelli Legacy Sport, which will be incorporated into several forthcoming articles. This is a truly stunning semi-auto sporting clays target crusher that not only boasts a superb fit but also is aesthetically elegant. Please see their website at http:// www.benelliusa.com. I re-introduced myself to Steve Lamboy, marketing director at Zoli, at the insistence of Chris Batha, the internationally acknowledged gunmaker and writer. At last year's SCI Convention I casually handled the guns and chatted amiably with Steve. This year I received a doctorate education in the Zoli guns from none other than Paolo Zoli, the company's director. Paolo also informed me of the family history and its role in the Italian gun trade. Zoli is the third oldest continuous family arms business in Val Trompia, joining Beretta and Fiocchi. It has made world-class firearms since the late 1800's. Now Steve was pointing out to me the refinements of the Zoli modified Boss design, the unique trigger system and the reinforced springs and sears. I first met Lee at the 2006 Grand Masters Engraving Symposium sponsored by the Glendo Corporation in Emporia, Kansas. I liked Lee immediately, not only because his work is soul churning but also because he is one of the finest men in the gun trade. I've followed Lee's work since that first meeting. His work improves geometrically each year. 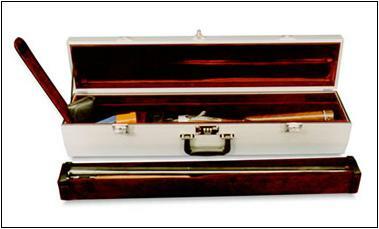 This company offers the highest quality and strongest aluminum gun cases. They comply with all airline regulations and can take a beating. I've traveled through Turkey and South America with these cases. They've been dropped, kicked, run over in one instance by a pick-up truck and were scratched, of course, but not damaged. I also own a Model 3080 Motor case, which is used exclusively for the two or three precious shotguns I own.